Britain?s Steve Cummings (Barloworld) is the new leader of the three-day Giro di Calabria race in the south of Italy after winning the second stage to Chiaravalle. Cummings beat Daniele Pietropolli (LPR) and Francesco Failli (Acqua & Sapone) in the dash to the line after getting in the decisive 15-rider break that formed on the final lap of the stage. It was his first ever win as a professional and he had the added bonus of also taking the overall race. If he can control his rivals in Wednesday?s final stage he can secure overall victory and prove he is far more than just a track pursuiter. “I can’t believe it. I didn’t know what it was like to win as a professional but it’s a fantastic feeling,” Cummings said after his win. Speaking to Gazzetta dello Sport after his win, Cummings made it clear he races clean. The 26 year-old from Liverpool suffered with a knee problem during the New Year but has worked hard in recent weeks. He is facing a race against time to get back to his best and earn a place in the Great Britain team pursuit squad for the world championships but his win will have boosted his confidence after a difficult winter. 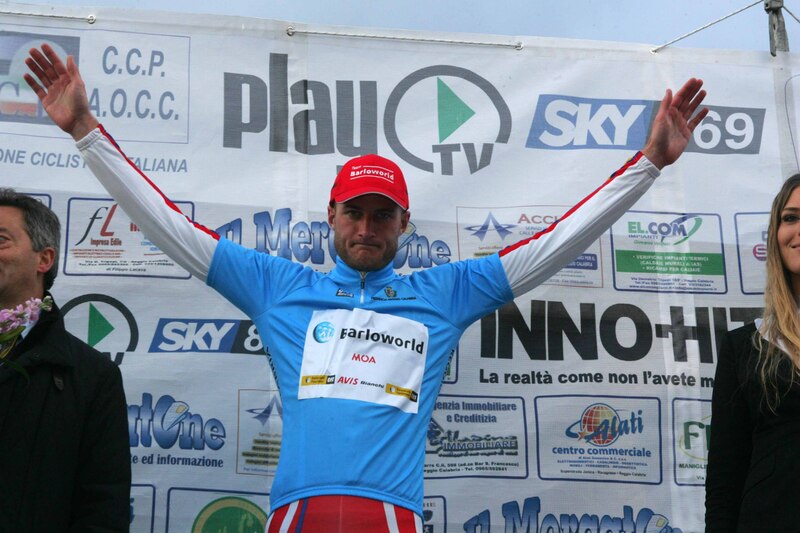 Steve Cummings takes his first win for Barloworld at the Giro di Calabria.